With thousands of satellites orbiting above our heads, there is an urgent need for accurately predicting their trajectories to avoid potential collisions. In space terminology, it is known as Space Situational Awareness. Scientists from Lawrence Livermore National Laboratory in California have developed just the system which can be a possible solution to this issue. 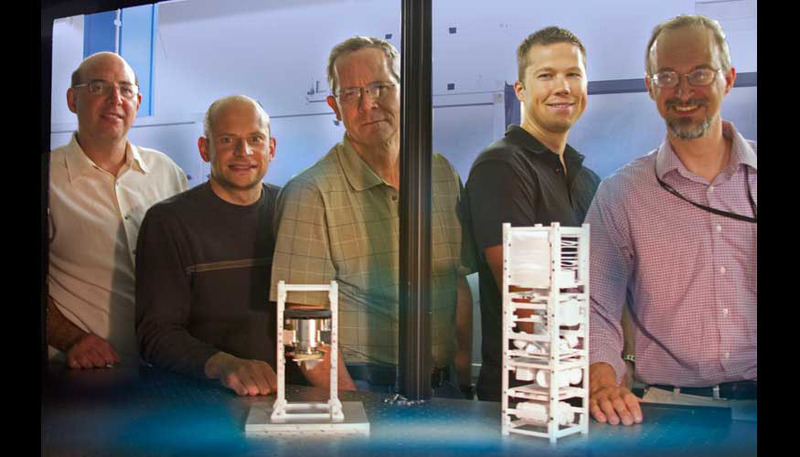 From left to right: Brian Bauman, Vincent Riot, Darrell Carter, Lance Simms and Wim De Vries have developed and tested land-based mini-satellites that eventually will be used in space to help control traffic in space (Credits: Julie Russell/LLNL). The proposed system of mini-satellites, popularly known as “Space Cops,” has been developed to track and refine a satellite’s path, ultimately providing better Space Situational Awareness. These satellites can individually record space objects optically at various ranges and relative velocities, as scheduled by the ground infrastructure depending on the closest approach distance (typically less than 1000m) of the nearest available observing satellite. In addition to numerous satellites in low Earth orbits (LEO), the growing number of space debris objects is also a concern. A collision between an Iridium (American satellite) and a Cosmos (Russian satellite) in 2009 proved how devastating these crashes can be. With the present Space Surveillance Network (SSN), positional uncertainty of a tracked object is about 1 km, which leads to approximately 10,000 false alarms per expected collision. Due to this high false alarm rate, satellite operators are not driven to re-position their space assets even when they’ve been warned of a collision hazard. Afterall, collision avoidance uses propellant, potentially shortening the life of the satellite, something no operator wants to do. For the International Space Station (ISS), a collision avoidance maneuver is performed if collision probability is higher than 1:10,000. Fortunately, in 2013 ISS did not receive any collision threats, but in 2012 four collision avoidance maneuvers were performed. With better resolution, ISS might require even fewer maneuvers. The proposed Space-Based Telescopes for Actionable Refinement of Ephemeris (STARE) mission, will consist of a constellation of nano-satellites in LEO, which can accurately predict and refine the orbits of satellites and space debris. A series of six images over a 60-hour period were captured from a ground-based satellite to prove that refinement of the orbit of another satellite in LEO is possible. “Eventually our satellite will be orbiting and making the same sort of observations to help prevent satellite-on-satellite and satellite-on-debris collisions in space,” said Lance Simms, lead author of a paper on the subject appearing in an upcoming edition of the Journal of Small Satellites. The challenge in accurately predicting LEO satellite locations based on ground based tracking alone is rooted in the inability to accurately model movement between observations due to mass and surface area uncertainties. The uncertainty may lead to a rapid increase in error of location and speed of the object. Although the objective of the STARE mission was originally to refine the orbits of satellites and space debris to 100 meters or less, in the initial ground based test, the STARE system predicted the trajectory of satellite NORAD 27006 to within less than 50 meters over 36 hours of observation. “This lends credence to the capability of STARE to accomplish its mission objectives,” said De Vries. If successful the system can provide accurate collision warnings, with a much reduced false alarm rate.